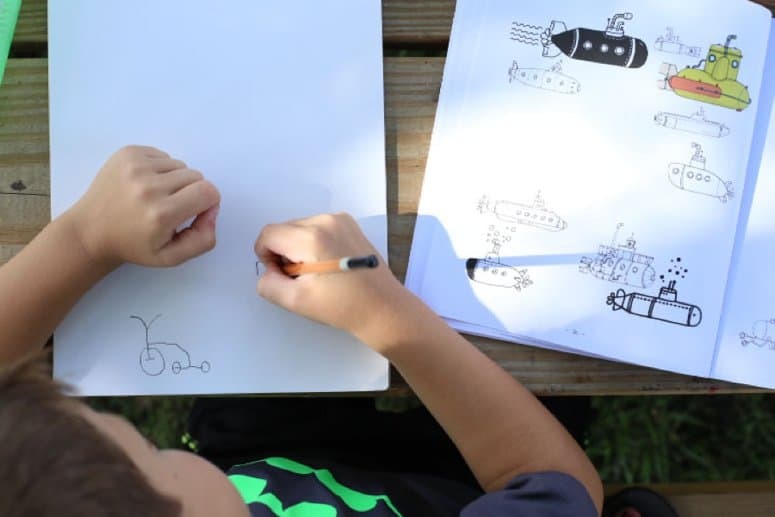 I have no artistic talent yet my children love art, so I’m always on the lookout for art materials the children can enjoy and use to teach themselves. 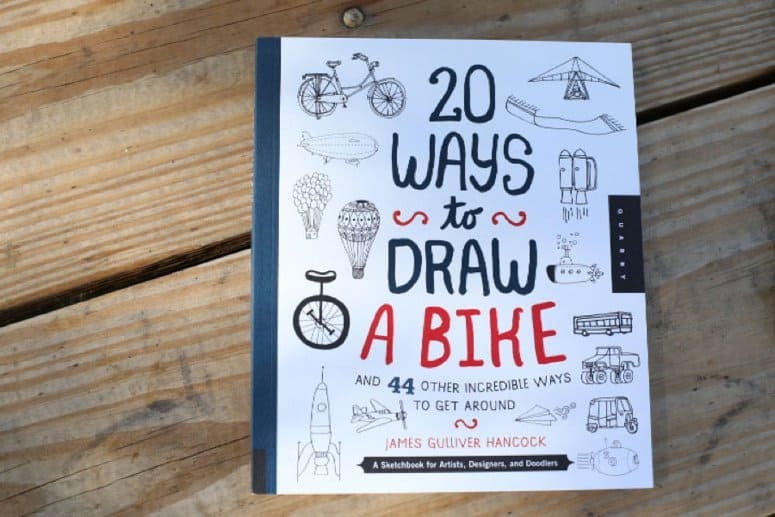 This month, that came in the form of 20 Ways to Draw a Bike and 44 Other Incredible Ways to Get Around – a sketch book for artists, designers, and doodlers by James Gulliver Hancock. Hancock begins by reminding readers that the best way to learn to draw is to DRAW. This book contains 45 different theme pages with 900 drawings to get you started doodling and drawing. Each mode of transportation is presented on a two page spread, with multiple different doodles and drawings to copy or expand from. Each spread also includes plenty of white space so little doodlers can practice right in the sketchbook. The pages are nice and thick, so no worrying about pens bleeding through or pages tearing with erasure. 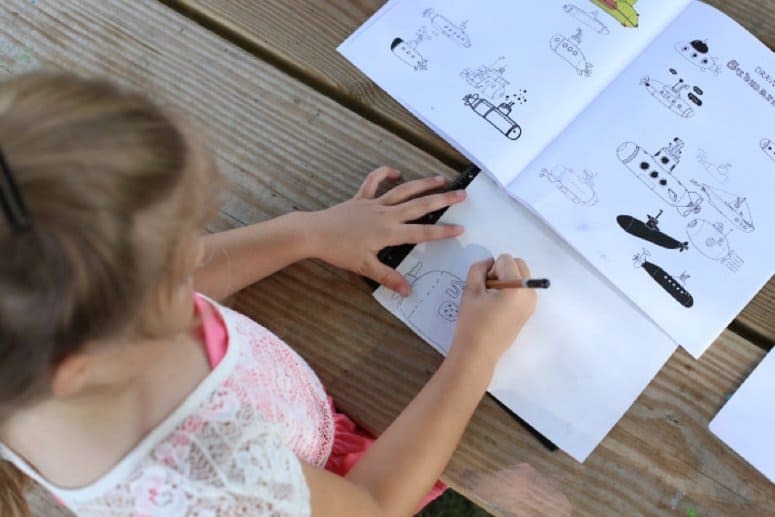 Examples of the objects include cars, strollers, boats, rocket ships, submarines, helicopters, skateboards, magic carpets, tractors, surfboards, canoes, race cars, and many more. This book is not a step by step drawing book- no drawing instruction is included. The drawings are easy to copy and expand on. Even my 7-year-old filled a page with doodles one afternoon and now I have an adorable page of baby carriages and hot air balloons on my bulletin board. 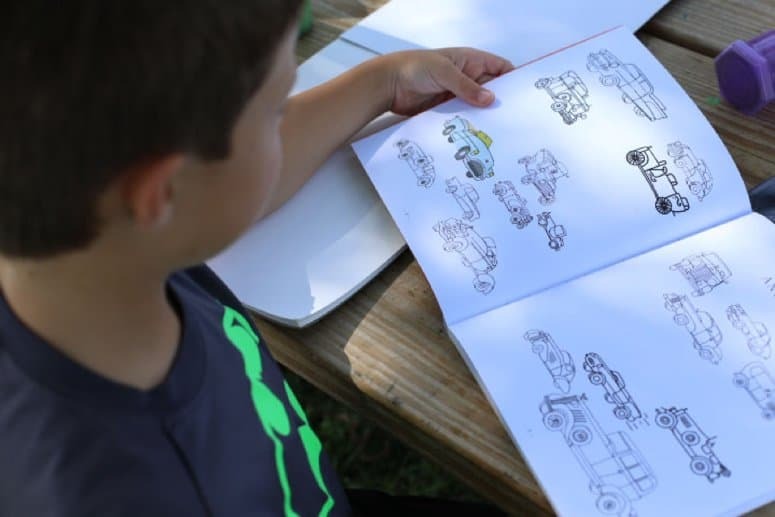 I gave this book to my 9-year-old son one hot afternoon, and he drew until nearly bed time filling sheet after sheet with air planes, garbage trucks, rockets, and more. 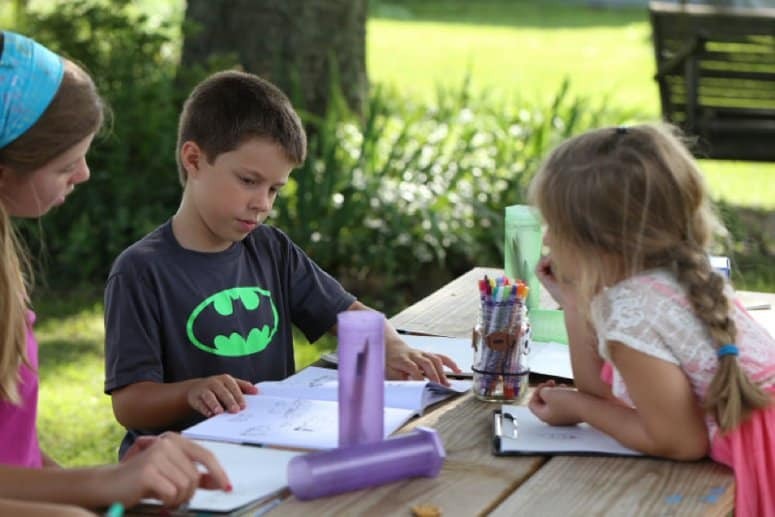 It didn’t take long for older and younger sisters to find him, grab their own sketchbooks, and crowd around the book to make their own doodles. 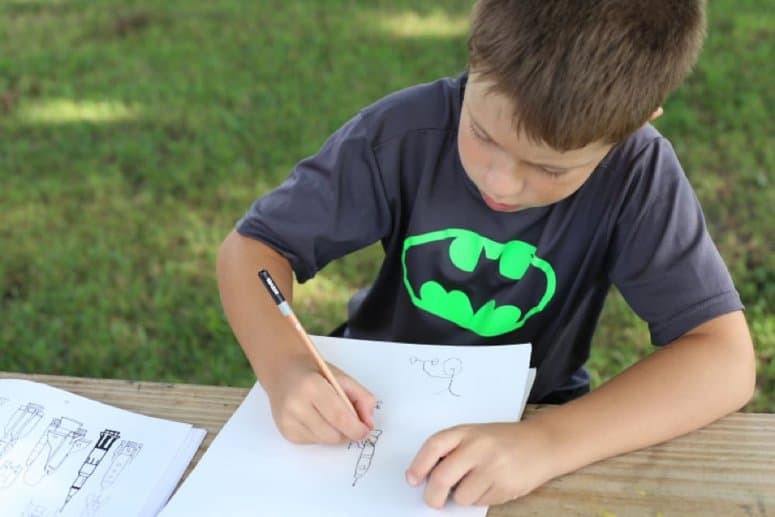 This book is perfect for the child or teen who loves to doodle, or hopes to learn to draw well. 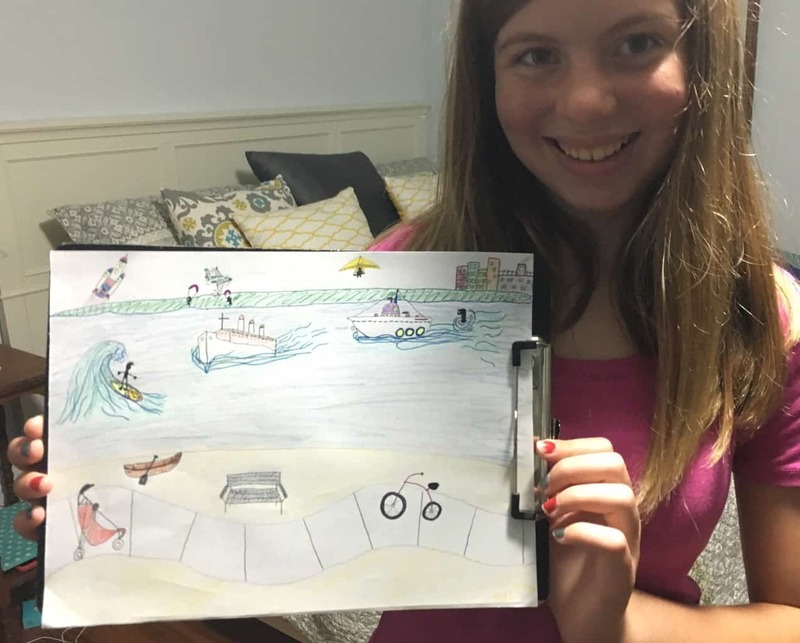 My children enjoy creating entire scenes filled with ideas from their new book. In fact, the kids love this book so much, that the rest of the titles in the series immediately went on their Christmas wishlist. I plan to leave 20 Ways to Draw a Bike on our art shelf so the children can use it whenever they wish, but I also plan to use it during writing time. For a reluctant or stumped writer, creating a quick, fun drawing can often get the creative juices flowing. Creating a story about a drawing seems to be a painless way to get my kids writing- and this book is a great tool for that. I’ll leave you with a photo of the latest picture my oldest daughter drew using 20 Ways to Draw a Bike. Head over to Timberdoodle Co to get a copy for your kids!